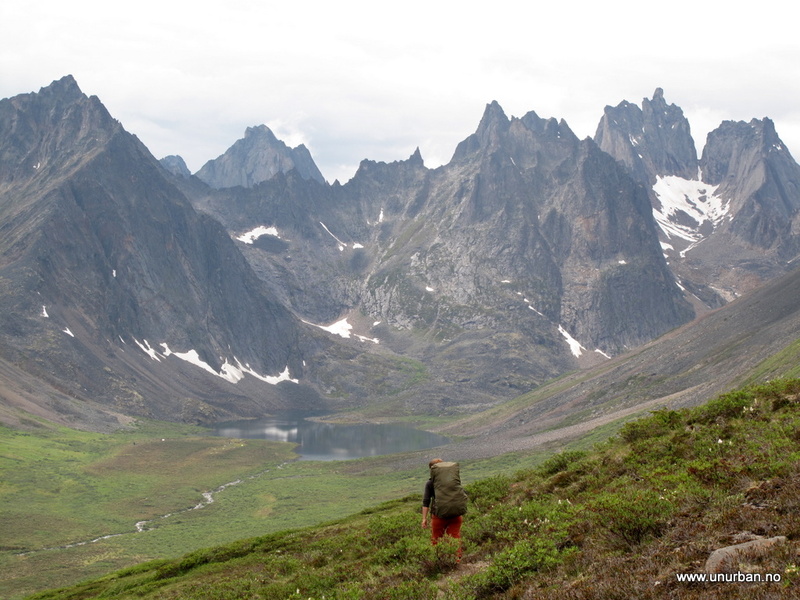 unURBAN Adventures - Alaska to Argentina to AFRICA! 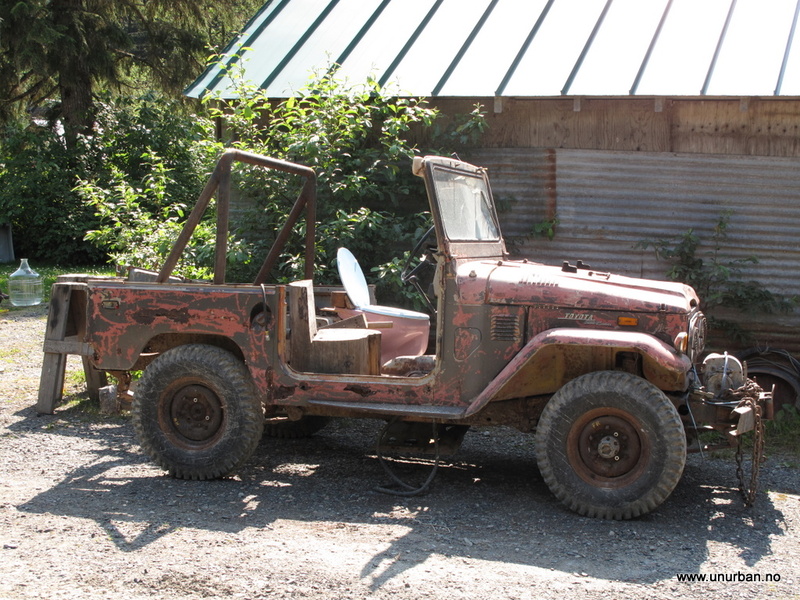 unURBAN has been on the road for a couple of months, and as we drove out of Dead Horse, Alaska, a couple of days ago, we concluded that the "test drive" from Florida to Prudhoe Bay went okay, and that it is now time to launch "The Real Trip". The plan is to drive south when we feel it is time to move on, and we hope to end up in Ushuaia in a years time. We have prepared a website, of course, but we also post pictures and stories on an exclusive selection (!) of relevant forums, so we'll try to post up here as we drive along. Has been a little while since the last update. Sorry about that, and don’t jump to any conclusion of us being lazy… Alaska is a big state, and it is a loooong way between the internet access points! After McCarthy we drove the Denali Highway over to the Denali Park, then to Fairbanks, north towards the beginning of the James Dalton Highway, and had a detour into Manley Hotsprings that turned out not to be a detour at all. More about that later. From the gravel road going back from McCarty, we got onto Highway 4 from Valdez, and drove north. We had a quick stop in Glennallen to fill up with fuel and food, and also got some Chicken Cashew and noodle dishes from a purple Thai food trailer next to the gas station. Delicious! If you see this trailer in or around Tok – go for it! 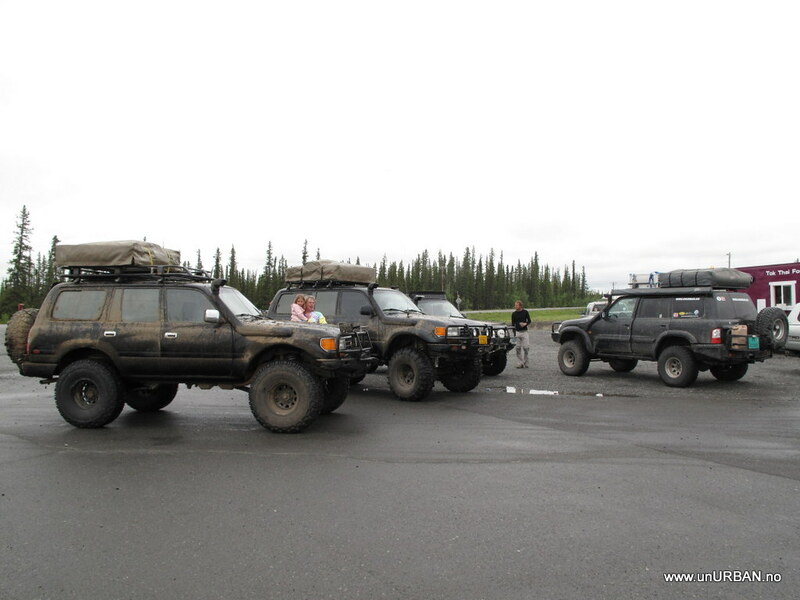 Here we also bumped into some guys from Anchorage driving heavily modified Toyota Landcruisers. 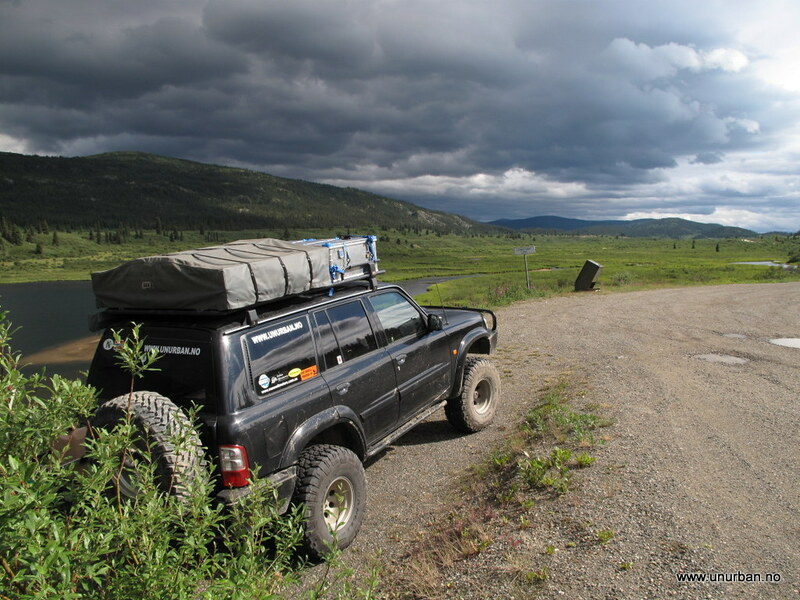 Turned out that they had been out scouting for a Landcruiser event in Tok the following weekend. 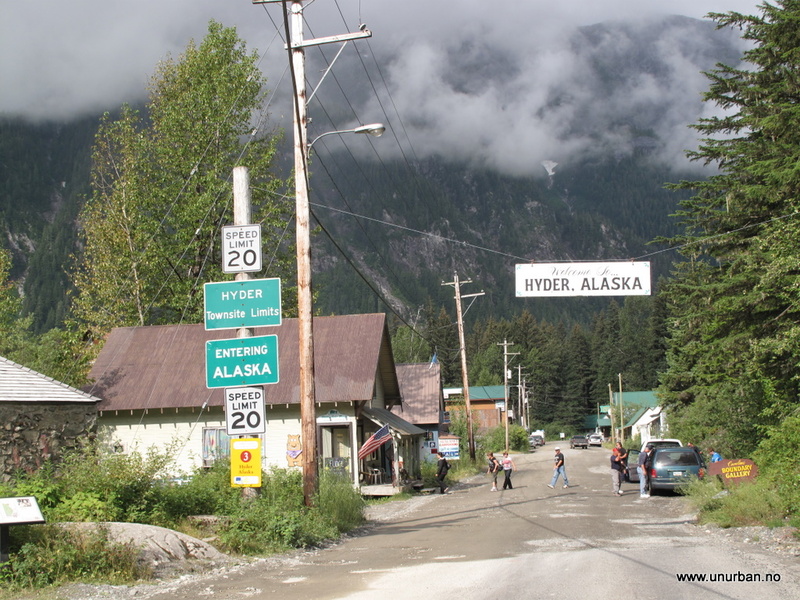 Looked really muddy… We’ll see if we can coordinate driving through Tok this weekend. Would be fun to have a closer look. So! 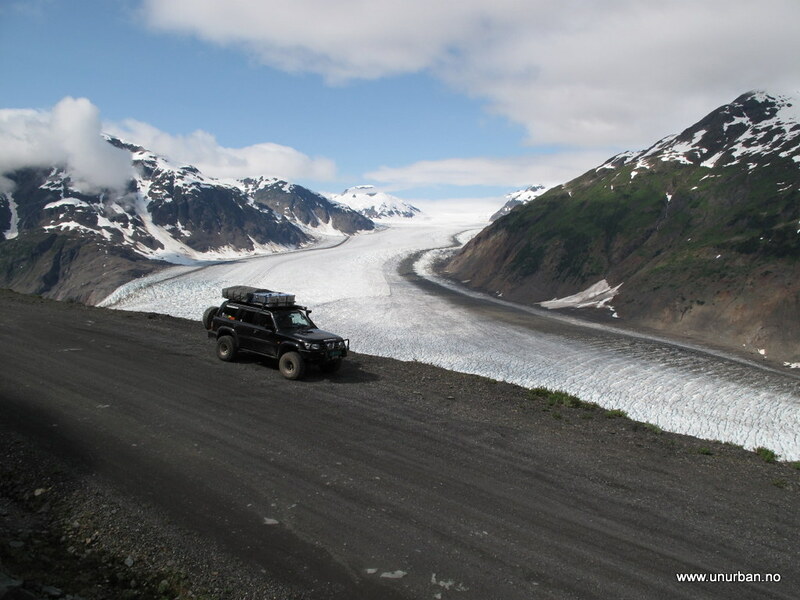 From Glennallen we headed north to the start of Denali Highway. 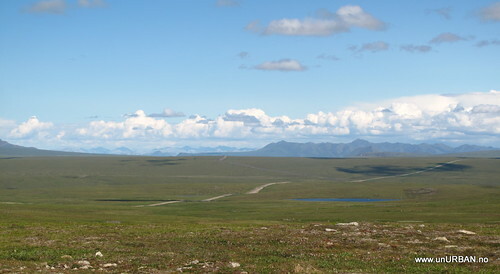 It is a gravel road going west over the mountains from Paxon, and it ends up just a few kilometers south of the entrance to the Denali National Park. This is a beautiful mountain pass, and on clear days it is possible to see the Mount McKinley/Mount Denali (highest peak in North America) from parts of the road. That didn’t work out for us, though, but the landscape is breathtaking. When we crossed over it was still early in the season, and there were not too many other travellers on the road. This also meant that most of the turnouts were empty, and we camped on the most scenic of them all. The evening was spent watching a couple of beavers doing their beaver-things in the small lake just next to our camp, accompanied with a couple of very good Alaska Ale. We also noticed a lot of moose dumps around the camp spot, but no encounters with big animals so far. 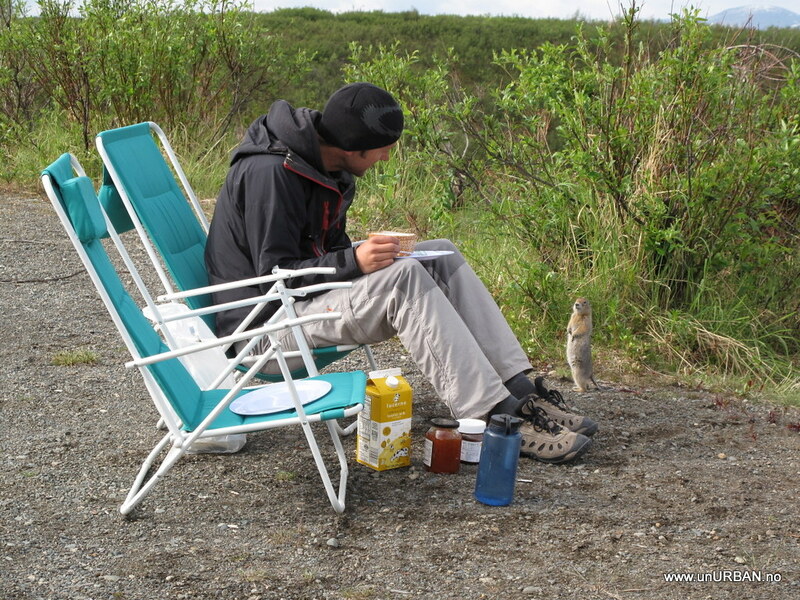 The only wildlife bugging us (besides the bugs...) was a ground squirrel a little too interested in our breakfast the next morning. Closer to the west end of the road is a nice little gravel road going up into the mountains a little bit further north. This is a state road with public access, but mostly used by miners. It was an interesting drive, and we tried to shoot some video of the trip. If we can figure out our video editing software, there will be some posts with video clips on our page shortly. Spent the night in the “city” at the entrance of Denali Park (Denali Rainbow Village), by locals often referred to as Glitter Gulch, as it is mostly souvenir shops there. We also saw some rafting companies, motels, and RV parks. Noisy place, and the water tasted funny… Continued north from here the next morning, and decided to check out the Stampede Trail before heading up to Fairbanks for more supplies. That's a MEGA test drive! Will definitely be following this one. 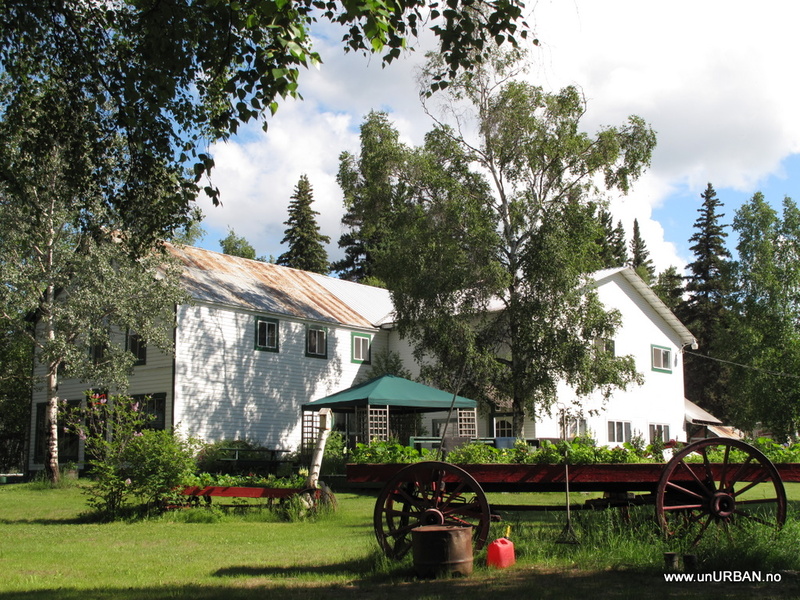 Espen and I were invited to come to Manley Hot Springs and to stay with Demaris and Art on our way up north in Alaska. So we did, and we had some amazing days meeting interesting people and see a bit of the Alaskan way of life. Manley Hot Springs, like many other places in Alaska, came into life supporting mining and the people involved in it. Today the community consists of about 60 people living there year round. Art and Demaris have cabins, http://www.alaskawilderness.net/index.html further out in the Alaskan wilderness were guests can come to stay for fishing, canoeing, hiking, and to do whatever they dream of doing in the Alaskan Wilderness. Guests come to stay for a few nights, a few weeks, or even for a year. There are no roads to the cabins, so Art, who is a pilot, will fly the guests out to the different cabins. When we got to Manley Hot Springs Art was flying up supplies to the cabins, and their first guests would arrive in July. Manley Hot Springs got is name after Manley who built a hotel at the Hot Springs in 1906. The hotel burnt down in 1911 and today the hot springs is privately owned and there is a greenhouse on the site heated by the hot springs. Public is allowed into the greenhouse and the hot springs for a fee of $ 5 per person, but then you also have the greenhouse all to yourself. 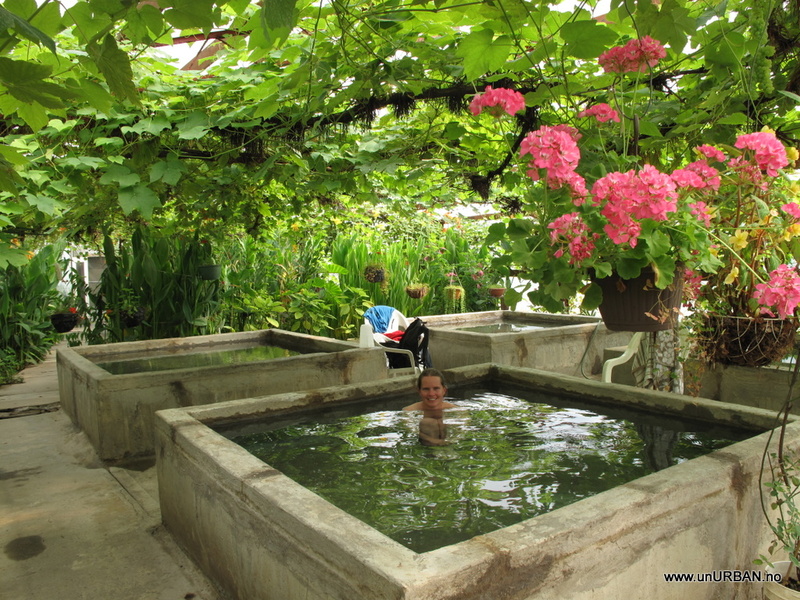 We had heard about the hot springs, but the surroundings took us by surprise. Who expect to be surrounded by tropical flowers and ripe grapes at 65 degrees north? One day we visited Joe and Pam Redington at their Iditarod Kennel http://www.joeredington.com/ I have never seen so many dogs in one place my whole life, and we were told that that this was less than half of the amount of dogs they had at one point. I cannot even imagine how much work it is to look after and train so many dogs. From a cooks perspective it was a huge pot of food that had to be boiled with fish, chicken and rice to make a “lovely” stew to feed the dogs. Espen meet his name brother Espen who lived in Manley, and Espen also happened to come from Norway… And it must be for that reason that Manley Hotsprings is the first place in America where everybody manages to pronounce and remember Espen’s name on the first try. 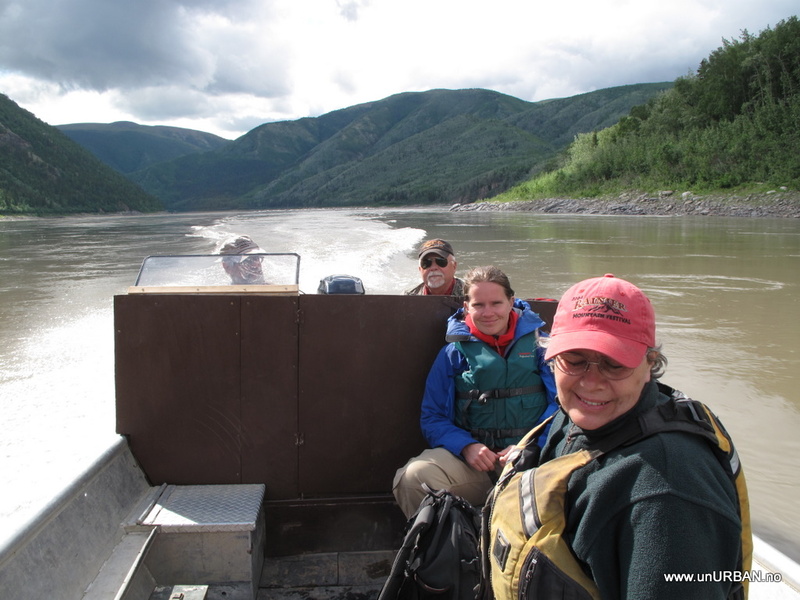 He invited us for a boat ride down the Tanana River, and for us that has seen Alaska 98% of the time from the road, it was great to get out and see the nature from the river. 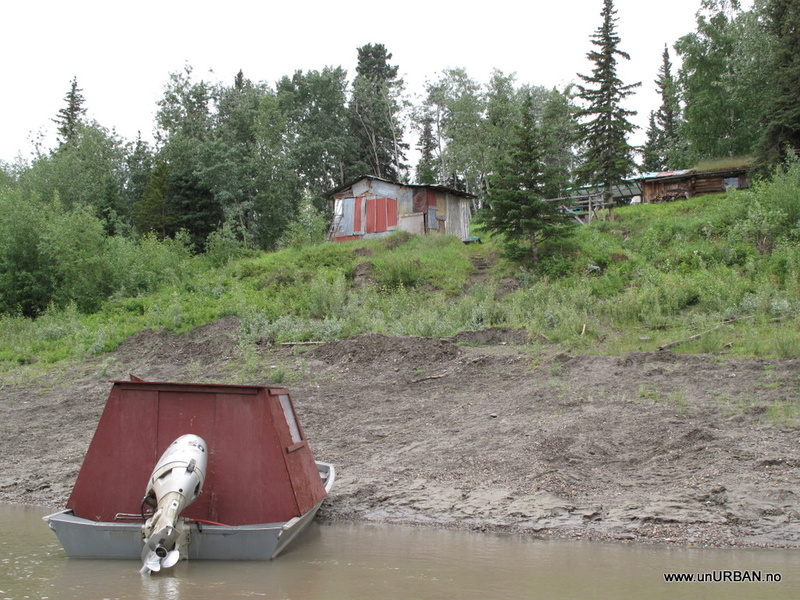 Along the river we also saw two moose cows, but still no grizzly bear - where are they hiding? 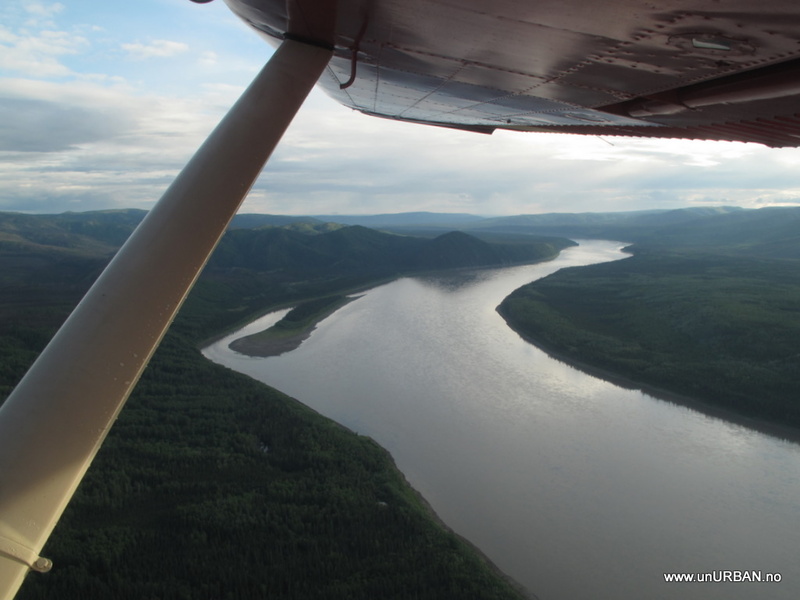 On our last day in Manley Art took us out on a flight over to the Yukon River. I had never been in a smaller plane than a Twin Otter before, and for both Espen and me it was the first flight ever with floats. It was an amazing flight and beautiful views from the plane. It was incredible to fly over the Yukon River and to see how big this river is, and it has definitely changed since we last saw it in Whitehorse in Canada. Art was bringing mail and a few other things to friends that stayed along the river in their fish camps. 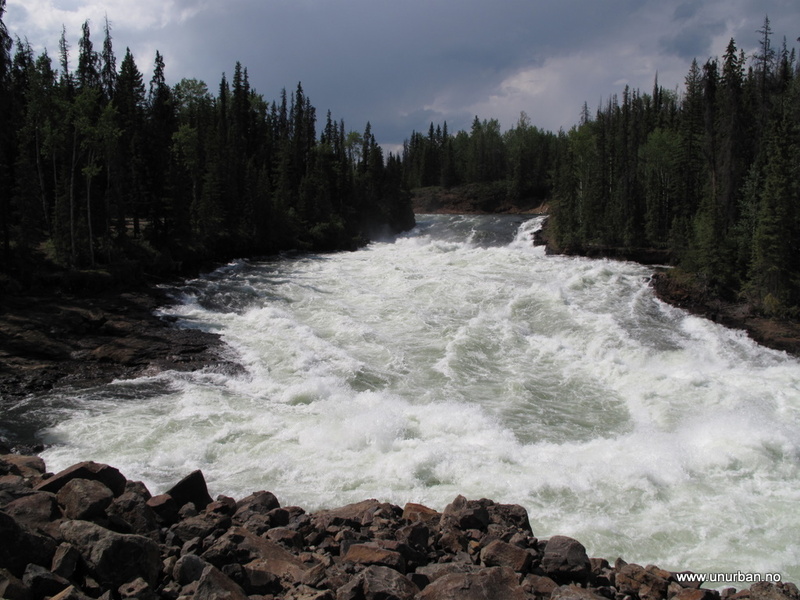 They had been in their camps for a little while preparing and waiting for the King Salmon to come up the river, and from reports further down the river they were expecting them one of the next days. Nets or fish wheels are what they use to fish the salmon. When the fish is caught then the work start to conserve it, and the fish camps that we visited all made smoked salmon strips that they would later sell. Salmons with lower quality meat were dried and used for dog food. The beginning of August is the end of the season and the fish campers move back to their homes. Thanks to Demaris and Art and all the people we meet in and around Manley that made it to an incredible experience for us. 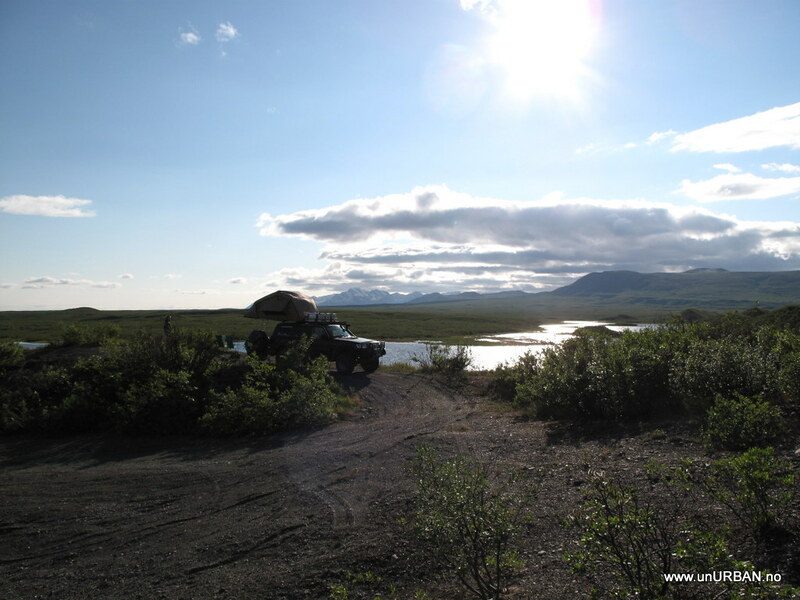 To “start” our road trip we wanted to see the Arctic Ocean and travel from the northernmost point on the American continent to the southernmost point, and that meant driving north on the Dalton Highway. 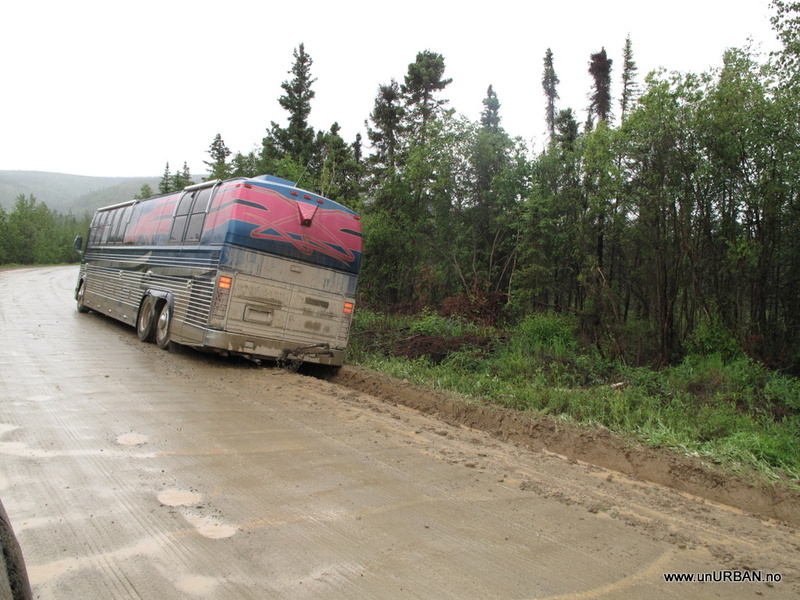 Dalton Highway or the Haul Road as it was called until the beginning of the 80’s, was completed in 1974. The road was built to get supplies and workers up the newly discovered oil field in Prudhoe Bay and to build the 800-mile long Trans-Alaska Pipeline that would transport the oil to the ice free harbor in Valdez. Before we started the drive we had heard about the bad road conditions, and again we think the road is not as bad as we had imagined it. 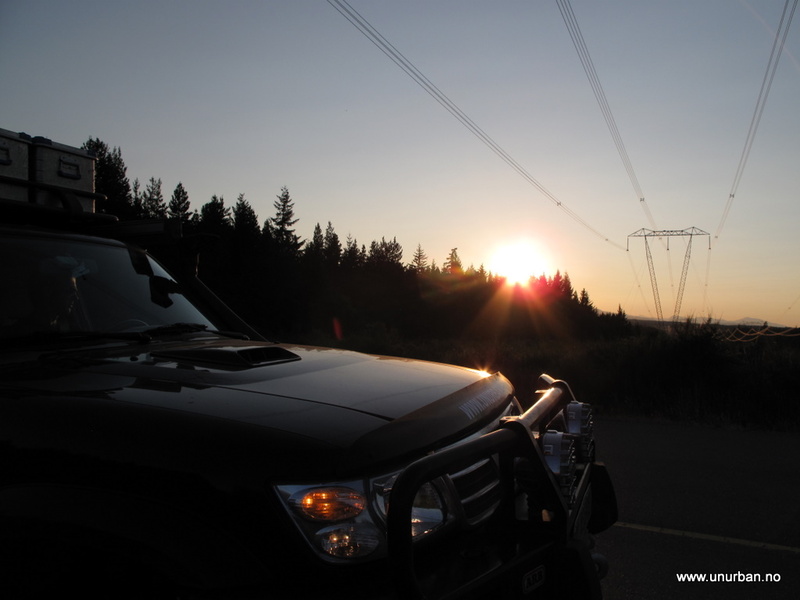 Sometimes we had to stop for road work, or slow down when we meet other cars and trucks. The dirt on the road is the worst, especially after driving on the stretches of the road where they mix calcium chloride with water which is sprayed on the road for dust abatement. This stuff sticks! 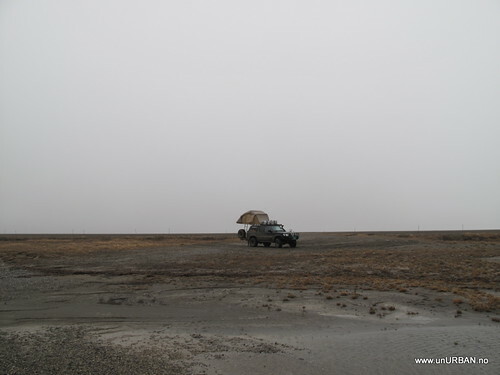 Plenty of time in a car wash has to be included in the budget if you plan to drive up the Dalton Highway. 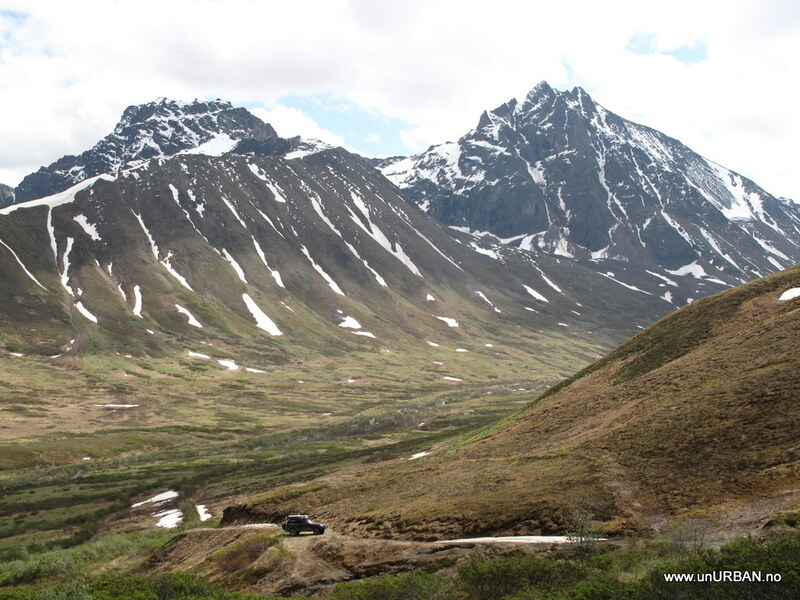 The drive up the Dalton Highway is beautiful and the landscape really changes from hills with boreal forest to the Brooks Range Mountains to tundra and to coastal plains up around Deadhorse. We were really lucky with the weather, and had great view almost all the way up to Dead Horse. The last couple of miles, however, we drove in to fog and rain, and the temp dropped significantly. 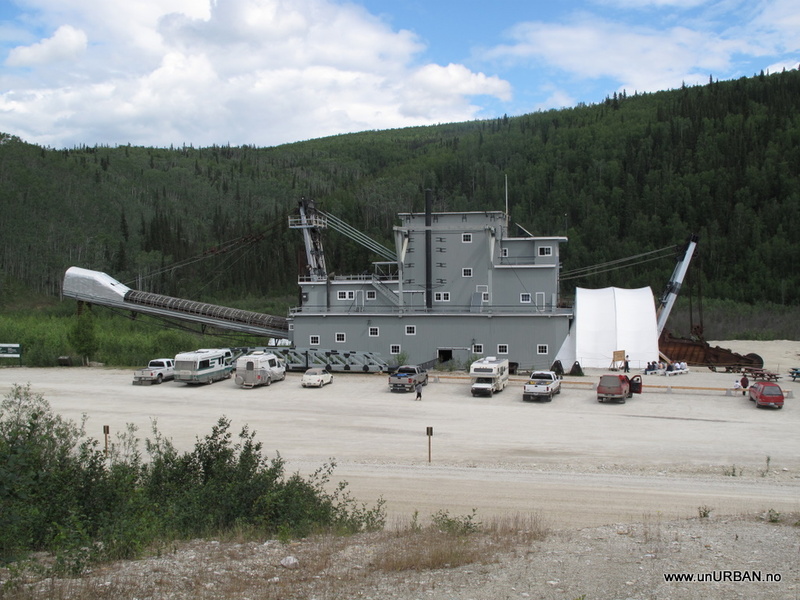 Looking around at all the equipment and machinery in Deadhorse we understood why the road is called the Haul Road. Everything up there has to be hauled up the road or shipped during the short summer. On our drive we meet a few really oversized trucks and some places support car stopped us on turnouts next to the road. 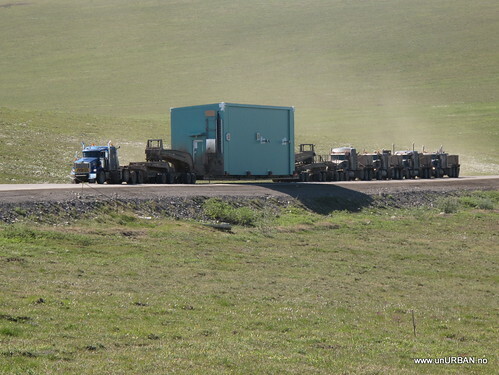 The most extreme was one truck pulling something really oversized, and there were four trucks behind the trailer helping to push the load up hills. We meet them about 150 km south of Deadhorse and it had taken them 5 days!!! to get there from Fairbanks (about 650 km). I total we used four days up and down the road. That was far north as you can drive in Amerca! Now we aim south! This is going to be a great adventure. Nice truck too! People thought we sounded crazy when we said we went home for a holiday from the holiday, and I guess it is kind of crazy, but at home it was a 60th birthday to celebrate and friends and family to visit. First stop in Norway was Ålesund were we flew into the Vigra Airport. A friend picked us up at the airport early in the morning and while we waited for a café to open up we had a sightseeing trip in the area. On this short trip we spent almost half the time on the road in tunnels going through mountains or under the sea. 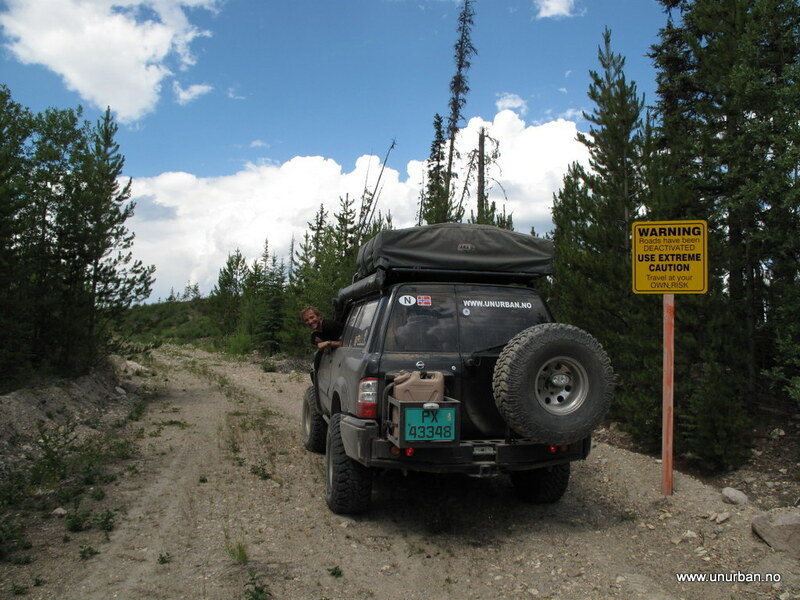 I realized then that on our drive for two months from Calgary to Prudhoe Bay, all the way north in Alaska, and back south again to Whitehorse, we had not driven through a single tunnel. That is amazing coming from Norway were we have tunnels all over, and especially on the west coast, where Norway is almost like a Swiss cheese. In Ålesund the 60th birthday celebrations started with a good lunch and a local football match between Ålesund and Molde. From Ålesund we drove through a couple of tunnels, took a ferry across a fjord and drove a bit more before we got to Volda, where Espen is born and raised. The west coast of Norway has an amazing landscape with fjords and mountains – it is just too bad that the weather rarely cooperates. But on a sunny day I do not think you can find a more beautiful place. So we enjoyed some sun and rain while visiting friends and family and celebrating birthdays. From Ålesund we had one night stop-over in Oslo staying with friends and eating good food. The next day we filled up a friend’s car with all our bags (two big carry on, three big backpacks and a ski bag), stuff we did not need on the road trip, and drove to Siljan were Malin is from. More friends and family to visit and it was good to see them all again. While in Siljan we went for a swim in a lake and it was certainly colder than the last few places we have been swimming, as that has been hot springs with a temperature of about 40 degrees Celsius. On one of the last days we visited friends on a small Island, Sandøya, were they stayed in a cabin for their summer holiday. There we did not even dear putting our toes in the sea, as this was about 17-18 degrees. The summer was late in Norway this year. It was really nice to be able to go home for a short time, but now it is time to get back to Canada and the Patrol! Top of the world highway! Going north we crossed into Alaska at Beaver Creek, so now we wanted to try another road and see Dawson City on our way south. Our only option was the Top of the world highway. We had been told the Top of the world highway is a beautiful drive, but we cannot really confirm that since we could only see 30 meters ahead of us. 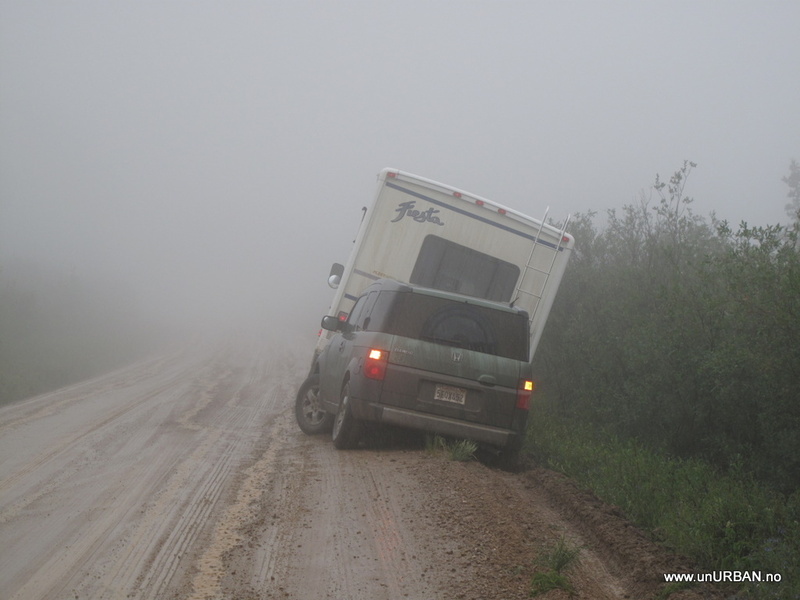 The most exciting part of the drive was passing RV’s that had driven off the road and needed help to get back up (but too heavy for our winch...). 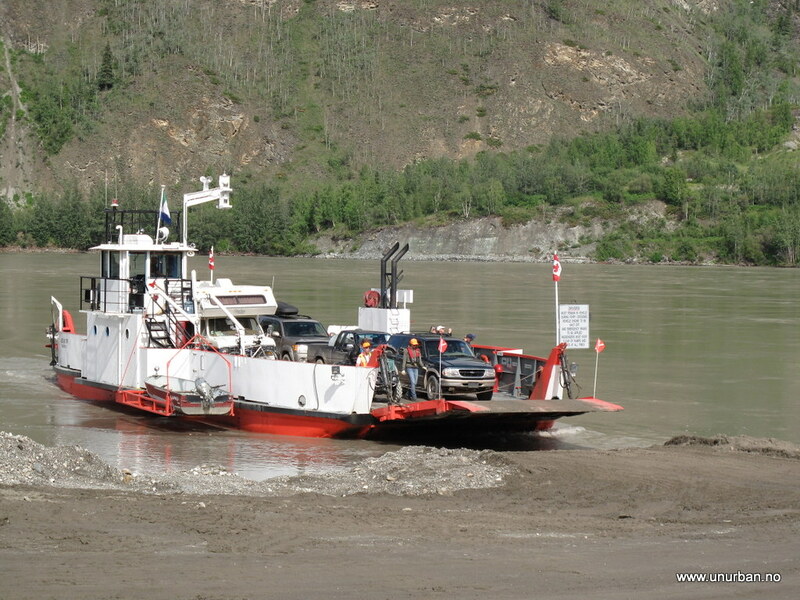 After a day in the fog we descended out of the fog and down to Yukon River were a small ferry took us across the river and into Dawson City. 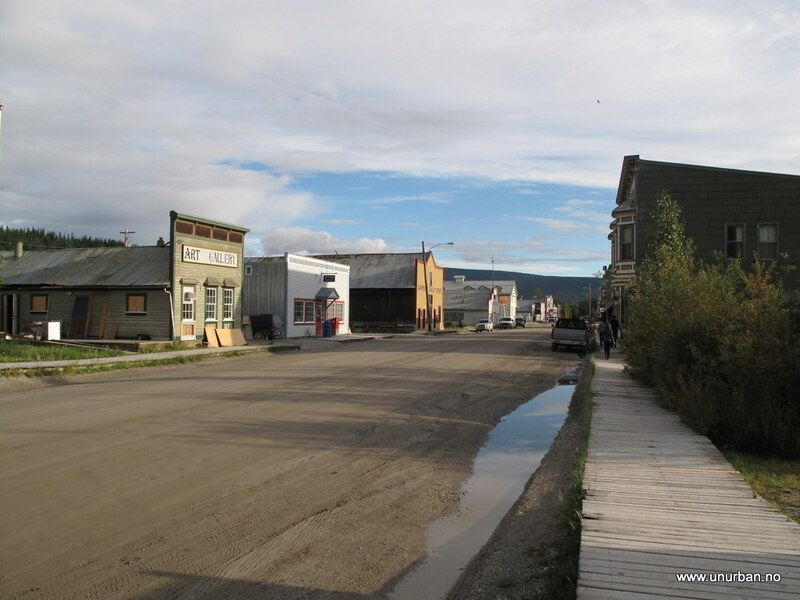 In Dawson we stayed at the campground in the city center so it would be easier to explore the really well preserved gold rush city. I like the detail about keeping almost all the streets as gravel roads. The streets with wooden boardwalks and well restored houses gives the city a great atmosphere. 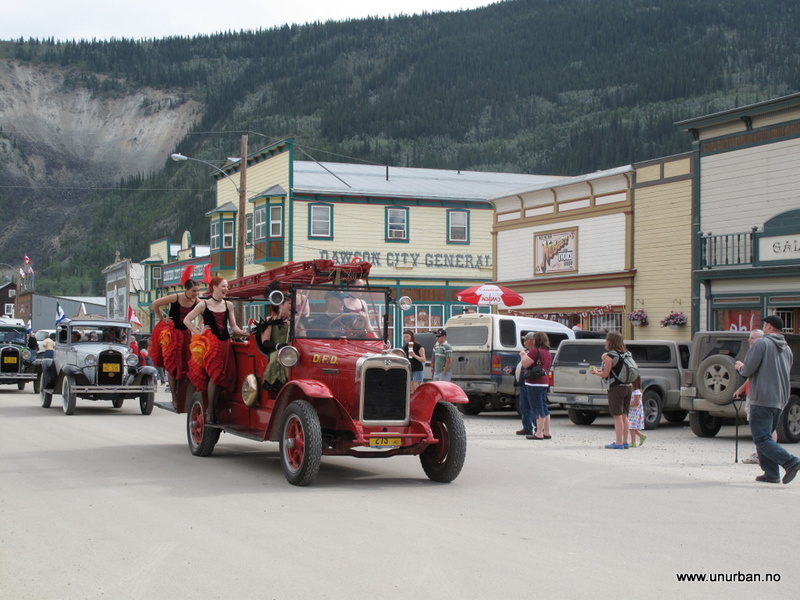 Our last day in Dawson was 1st of July, Canada Day, and there was a parade on Main Street, followed by a gold panning competition were the winner would travel to the gold panning world championship. While we were in Dawson, we had to see Bonanza Creek where the Gold Rush started. On the way to Bonanza Creek we passed Dredge number 4 that was the largest of all the dredged that was used to dig for gold. After a few days in the “city” we felt the need for some nature again and headed to Tombstone Provincial Park on Dempster Highway. As you know, we went back home to Norway for two weeks for visiting family and friends, but are now back on the road. The 22nd of July we were back in Whitehorse, and kind of felt that the time home had been too short, but at the same time it was good to be back travelling again. We had scheduled some maintenance for our car at a local Nissan garage, mainly because I wanted to see if they could read the log of the engine’s ECU…which they couldn’t… They had the Consult3 reader, but the ZD30 engine was not in the database. S…! Really wanted to check the log after some sensor issues. The oil pressure switch is changed and dash warning light is gone, but I still haven’t figured out the loss in effect from a little altitude. Will definitely try the volt meter on the MAF one of the first few days. Well! From Whitehorse we drove pretty much as straight south as we could. 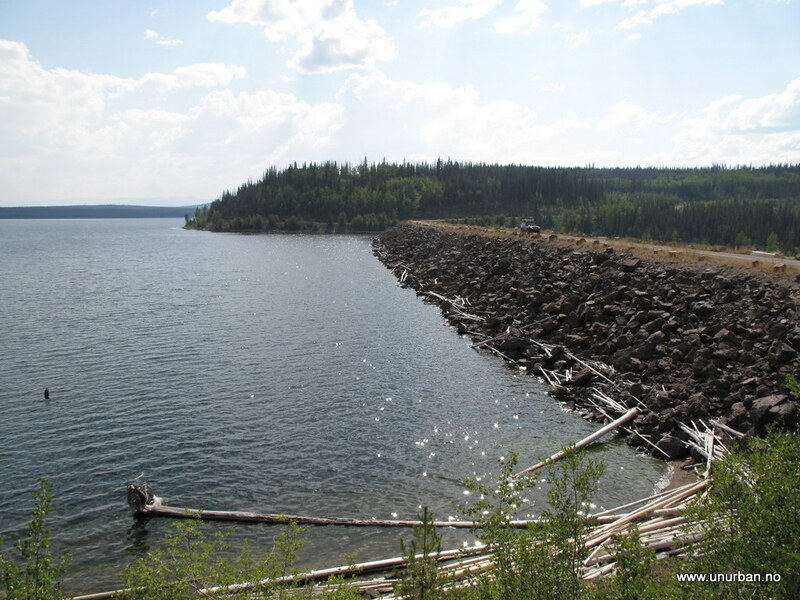 Back east to Watson Lake, camped on the way, and drove south along the Highway 37. 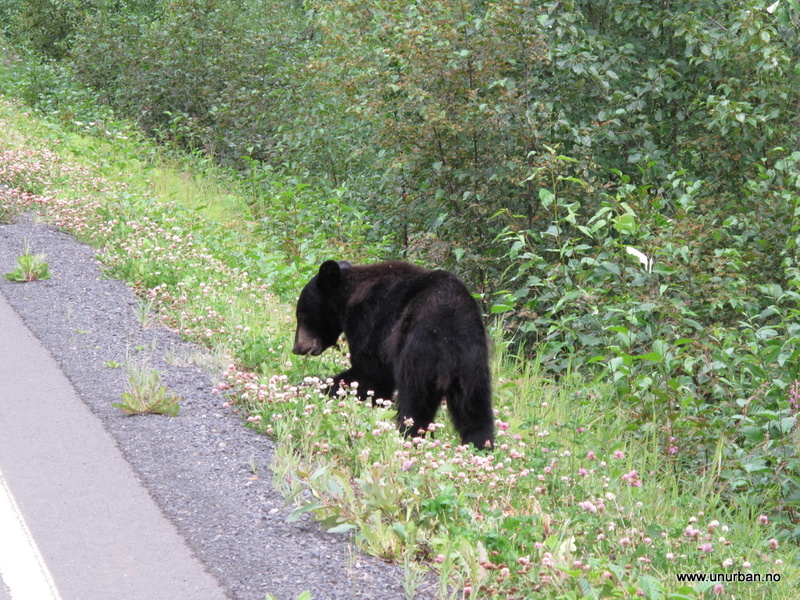 Saw 10 black bears along the way that day, even two cubs! Back in Canada (we actually crossed the border to Alaska to get into Hyder, before driving back into BC for a view of the Salmon Glacier) we kept going south, and we were quite fascinated of seeing the forest change from small “arctic-style” trees to the huge BC trees. 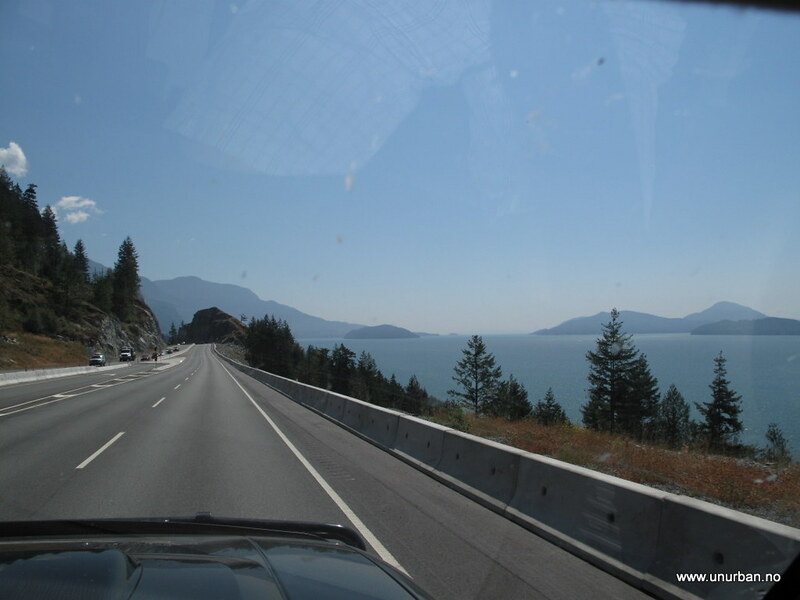 We joined the highway coming from Prince Rupert, and suddenly we were back in the civilization. Cars and houses everywere. I think we felt a little claustrophobic… But we did manage to get away as we came across some old forestry maps! More about that in the next post! wow, incredible trip report. We're glad to have to back on the road again. The driver's seat is great, but they don't believe in lug nuts. A big challenge for people travelling by car is that most maps, and all info in the Visitor Centers, are made with the average RV tourist in mind. 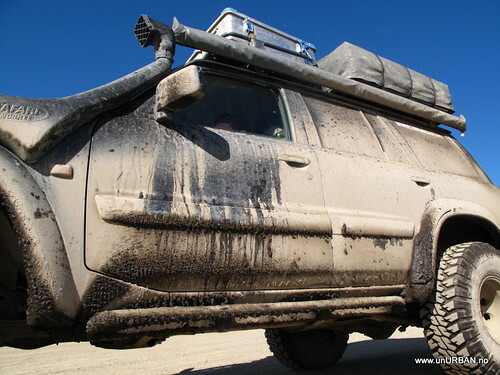 In the long run, this gets really boring if you are driving a big Patrol with All- or Mud tires. 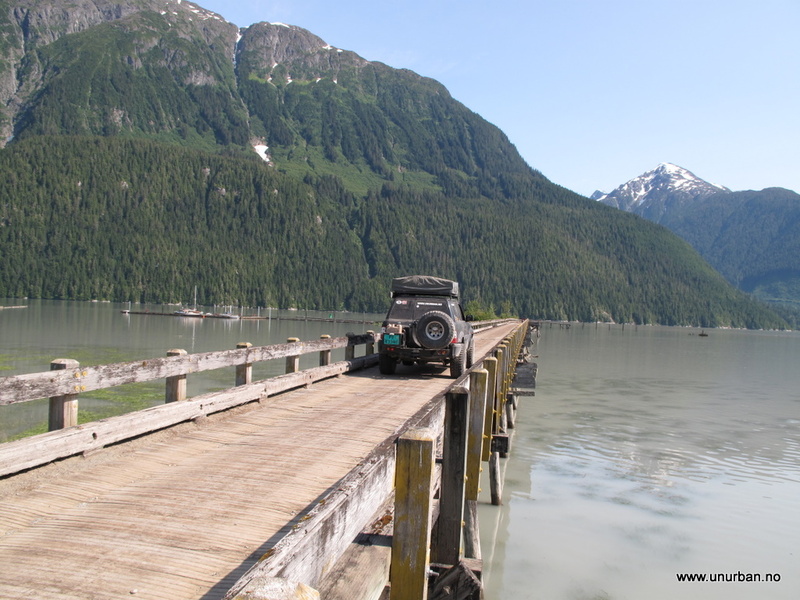 Not that this would be an absolute requirement for most logging roads, but at least the view feels a little better. So, how to solve this little “problem”? By getting the old Forestry Maps! Not very accurate as the ones we got were discontinued in 1997, but that is part of the fun… Found the first maps in Burns Lake, and turned off the main road and headed for Francois Lake. Felt a little bad about going into active logging areas without a VHF, but had no problems. Another nice little detail about the Forestry Maps is that they show all the Forestry Camp sites, which are free! 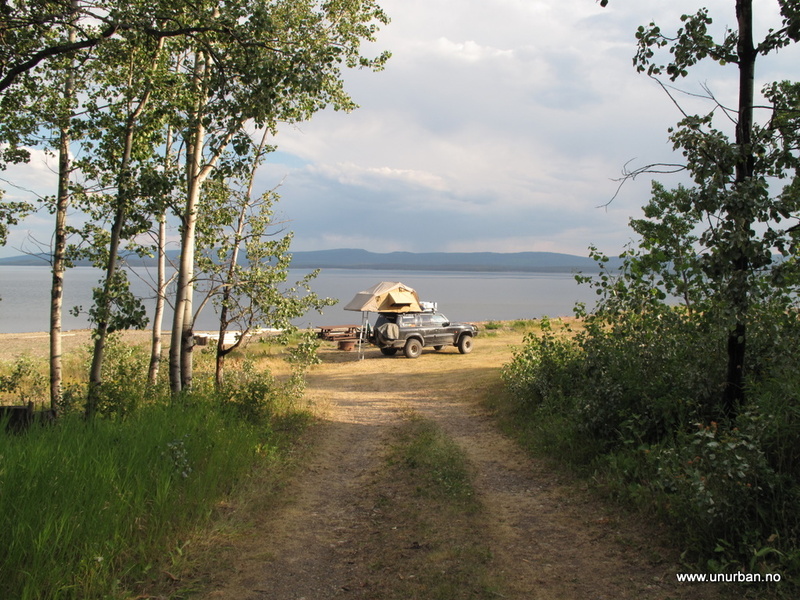 We spent the night at Ootsi Lake and studied maps and a thunderstorm passing the area. Missed the rain, and the view was fantastic! 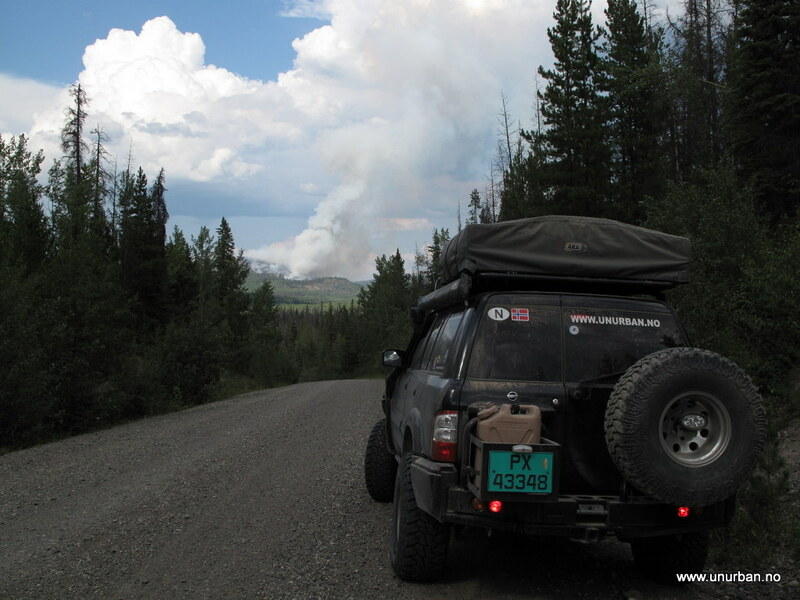 The next day we saw several places where black smoke came up from the forest where the lightning had hit and started fires. Still, it seemed that the local fire departments wasn’t too stressed out about it, and we heard that now the fires are not fought unless there is a risk for loosing people or infrastructure. One of the things we wanted to see in the area was a man made water fall that runs out of the Francois Lake. After the Kenny Dam came up, a new “outlet” was made to be able to control the levels. Now the gates were wide open to provide cold water for the salmon moving up in the rivers downstream, and the amounts of water going through were massive! A retired fire fighter we met at the camp site told us that one inch drop in the water level, equaled about 2 billion liters of water (if I remember right…), and the level was down at least a couple of inches in the last 24 hours. Well! 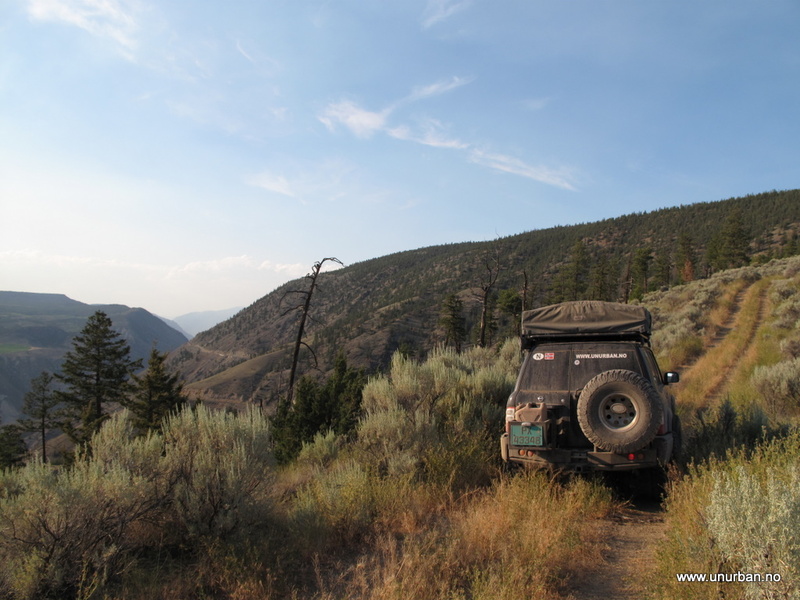 After poking around on logging roads between Burns Lake and Vanderhoof for a while, we got back onto the paved road and continued on to Lillooet, and there we took a detour going north up to Seton Lake and Anderson Lake. A fascinating scenery, and some incredibly steep switchbacks along the lakes in the area. I think the steepest was graded 18%. It was already dark when we came to Shalalth where we had planned to camp, and we could just not find the site. Drove on along Anderson Lake to D’Arcy and found a camp ground there. Glad I had the Cibies… The next morning we discussed going back up to have a look at the road and the area in daylight, but decided to push on towards Vancouver Island. And that turned out to be a good decision. What we didn’t know was that it was a long weekend, and we showed up at Horseshoe bay for a ferry to Vancouver Island on an early Friday afternoon. The place was pretty much packed, but fortunately we didn’t have to wait too long. After about an hour we drove onboard the ferry. The problems started when we went looking for a camp site on the east coast of the island. Full, full, and full! Ended up close to Port Alberni where there was a Provincial Park with overflow camping in their parking lot. 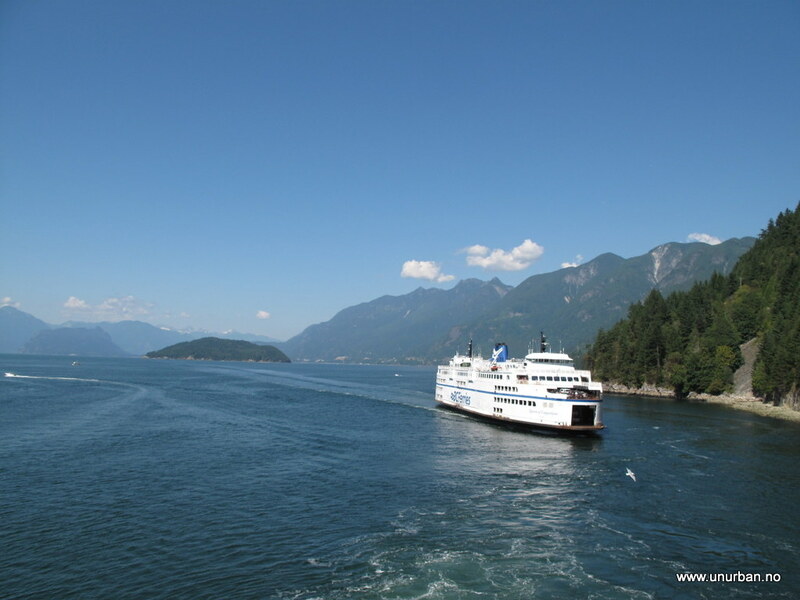 Finally on Vancouver Island! And thanks, JP, for inspiration ;-) Hope to look you up when we get to Chile. Drive safe! Sent you a privet message earlier. Was very excited to hear about your short meeting with my friend - Rami and Dorit. It is a small world, and it is amazing to hear stories like these. Keep having fun and updating us - you are having a great adventure.